Add all the ingredients for the beef ribs marinade apart from the ribs in a casserole dish and mix. I browned the ribs on all sides in a hot pan to sear, then added to the casserole dish of marinade. Turn around or pour over the mixture so it’s coated. Either put the casserole lid on or wrap in foil to steam as it’s cooking. I cooked my two ribs on 150C for around 2 hours. Meanwhile make the Asian slaw by chopping and julienning the veg and adding to a large bowl. Squeeze the juice of one lime, a glug of soy sauce and a drizzle of toasted sesame oil in a little jar. Stir and pour over the salad. I took out, turned the ribs over and cooked for an additional 30 minutes on 220C with the foil back on till it was soft and tender. Remove the ribs from the oven and let cool for 10 minutes. 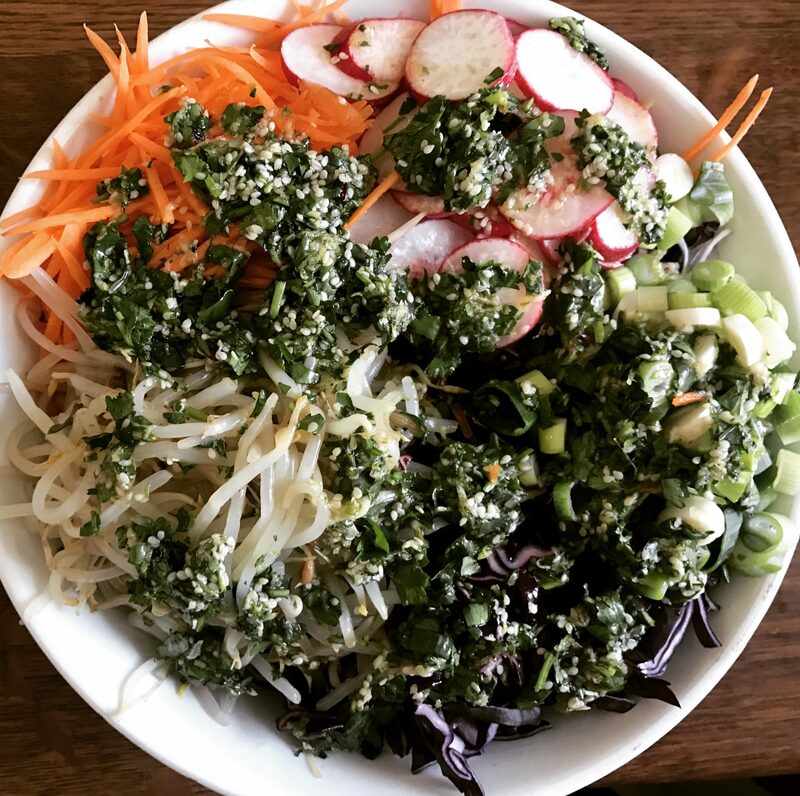 Take a pile of the slaw and place on a plate. Top with the rib of beef and spoon over a bit of the resting juices in the dish. Scatter with thinly sliced chilli, chopped fresh coriander and a sprinkle of sesame seeds. The choice is yours here but I made mine the night before to have for lunch cold in work as I thought it made a nice change to a hot noodle soup that I always pebble dash my white shirt with. You could have this warm too if you prefer. Place the cabbage leaves in one layer of a bamboo steamer and the kale in the other layer. Depending if you want to stop the raw onion overpowering the dish you can add the onions to the steamer for a few minutes too. Place the udon noodles in salted water and cook to packet instructions. Mine took 7 minutes on boil. Place the bamboo steamer on top of the sauce pan of noodles to steam in the same water as the noodles to save time and washing up. Add all of the ingredients of the soy dressing into a small jar and stir to combine or a small sealable container to take with you if eating cold on the go. Once the noodles are cooked, remove the bamboo steamer and take each layer of to stop the veg cooking and to leave them cool. Rinse the noodles in cold water to stop them overcooking and sticking to each other. Slice the steamed cabbage and kale if not already done so. Place the cold noodles in a tupperware box, top with the cooked and shredded veg and beef. Place in the fridge until you want to eat. When you’re feeling peckish you might want to use a bigger bowl and place the contents of the noodle box into the bowl, drizzle over the dressing and use chopsticks or two forks to toss and combine the dressing into the noodle contents. Sprinkle with a few more sesame seeds if desired. Empty the quinoa into a sauce pan, with a stock cube and a squashed garlic clove and top with water. Bring to boil and cook to packet instructions. Usually around 15 minutes but make sure they aren’t too mushy, you still want a little bite to give texture. Drain and put to the side to cool when cooked. Peel the butternut squash using a potato peeler for ease and to save your fingers instead of using a knife. Slice into 1 inch thick disks, cut each disk into 1/8’s so they cook quicker. Drizzle with olive oil then use your hands to make sure they are coated well. Place on a baking tray and season with salt and black pepper. Take 5 garlic cloves still in their skins and squash with the back of a knife. Place on top of the butternut squash spread out and place the butternut squash in the oven on around 200C for around 20-25 minutes. Halve and peel the shallots. Place on the baking tray with the squash after around 5 minutes of the squash being in the oven. Slice either side of the cavalo nero stalks so you are left with the leaves. I prefer cavalo nero instead of the ready cut bags of kale as they always have the thick stalks attached to the leaves and they take forever to remove compared to the whole cavalo nero leaves. Slice the leaves into 1 inch thick strips, coat with olive oil or fry light and add to the baking tray for around 10 minutes but keep checking as they can burn quite quickly depending on your oven. Remove the tray from the oven, checking that the butternut squash is cooked and soft. Set aside and leave to cool. In a bowl add the juice of 1 lemon, good glub of quality olive oil, the pomegrantate molasses, a cap full of red wine vinegar, harissa paste. 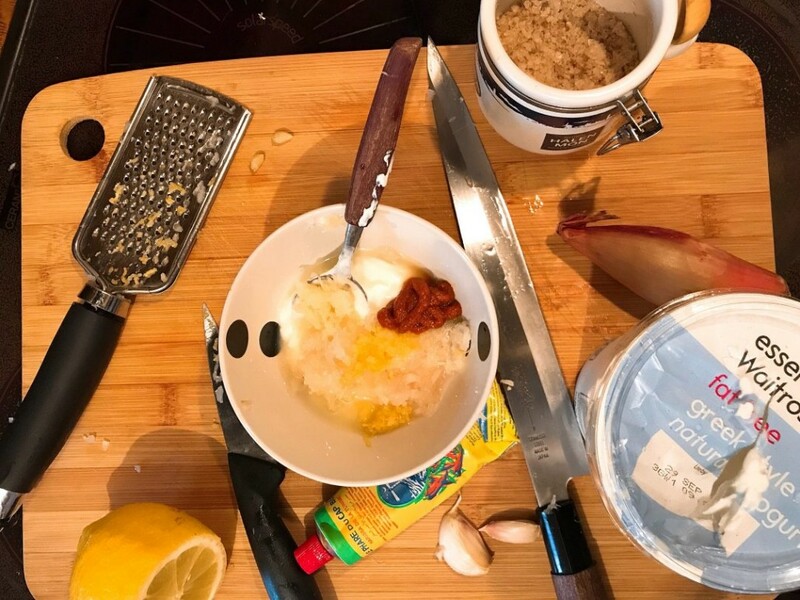 Take a medium sized clove of garlic from the roasting pan with the butternut squash, remove the skin and crush on a chopping board, then crape with the end of the knife to make a paste. Add the roast garlic paste to the dressing, season with salt and pepper and stir. Taste and adjust the proportions of the ingredients to taste as some brands are stronger than others. After everything has cooled down, remove the roasted garlic from the tray and place the rest of the cooked ingredients in a large bowl. 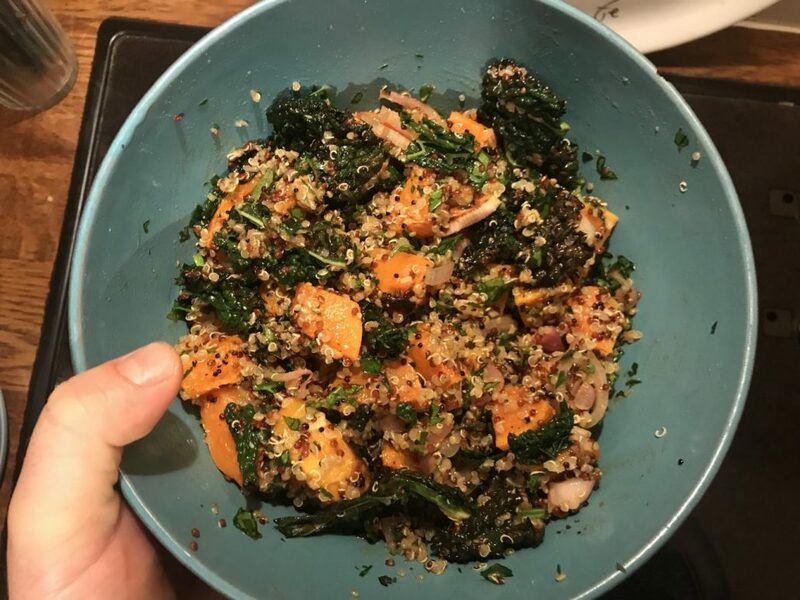 Empty the cooked and cooled quinoa to the bowl with the chopped parsley and mint and stir to combine. Drizzle the dressing over the top and continue to mix with a large spoon so that everything is equally mixed and coated in the dressing. Place in the middle of the table and dig in. This would feed two as a main with some meat such as chicken sausages that I paired with it or four people as a side dish with several other plates. To Spatchcock the chicken, turn the chicken over so the breast is facing down. Either take a sharp scissors or knife and cut down either side of the breast bone, remove and discard. Turn the chicken back over so the breast is facing up and the and the cut side underneath. Open up the carcas so that it spreads out on a flat clean surface or roasting tin and press down in the centre of the breasts until you hear it click and lays flat on the surface. Spatchcocking is great for reducing the cooking time down as the internal core temperature inside the bird doesn’t take as long as it’s one flat piece of meat now. Use a fine grater like the one used for Parmesan to grate the garlic and shallot very fine. Place all the other ingredients into a bowl and stir. 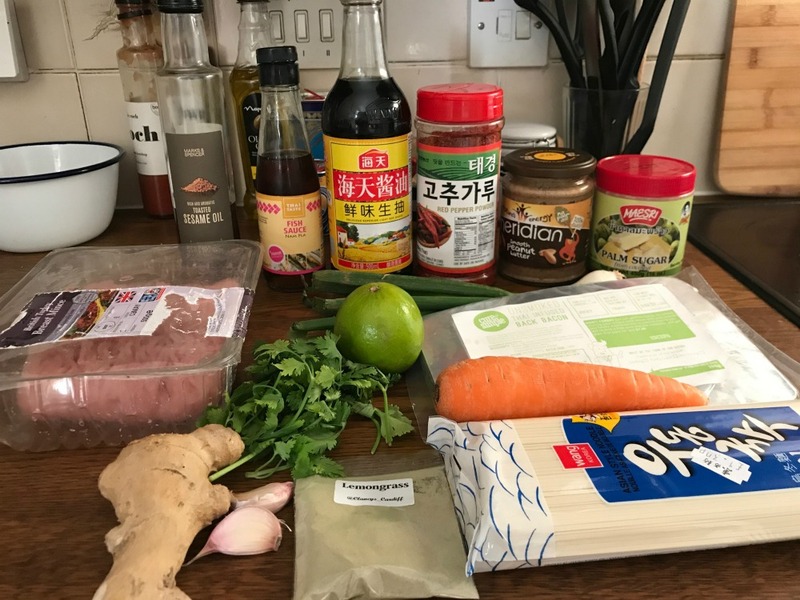 I don’t tend to weigh or measure the ingredients so you can play around with exact quantities to your taste putting in more or less harrisa depending on how spicy you want it. Make some incisions in the chicken all over to allow the marinade to penetrate and work it’s magic. Pour the marinade over the chicken and massage it in making sure to work it into all the incisions for ultimate flavour. Leave to marinade for at least 30 minutes or longer in the fridge if you have time. 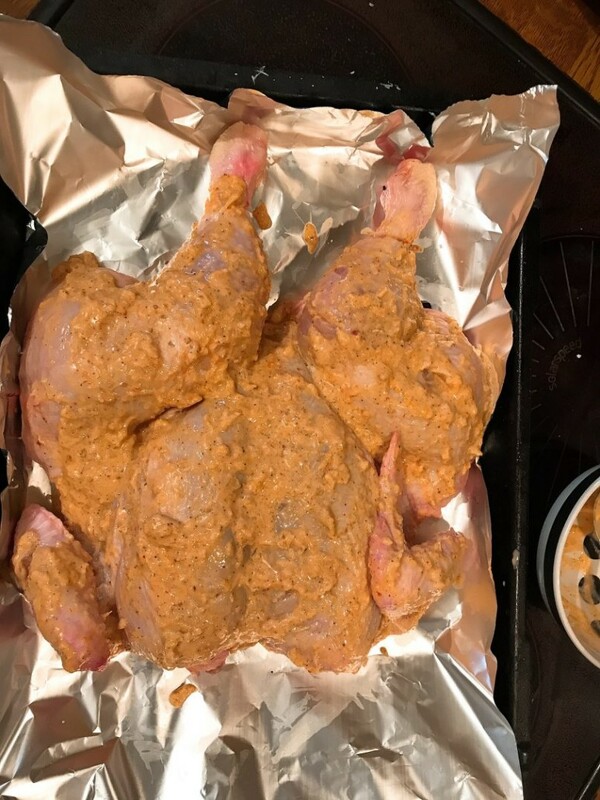 Once the marinade has had chance to absorb and leave it’s mark on the chicken, place the chicken in the roasting tin in the oven and cook for around an hour depending on weight on around 180-190C. Check the colour of the skin before that time to make sure it isn’t burning and amend the temperature and time accordingly so that it doesn’t blacken too much but cooked through. The juices should run clear on the thickest part of the thigh. Leave it to rest for a few minutes to save your little pinkies when carving or just yanking the spicy, slightly chared legs off. 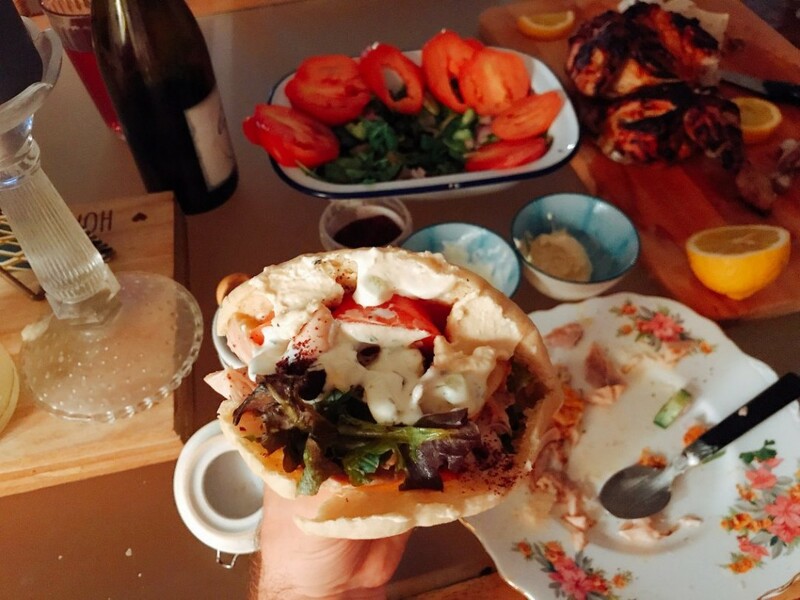 I served mine with with griddled or toasted mediterranean style pittas from M & S, halloumi, hummus, tzatziki, salad and a sprinkle of summac. Not that I have to say but would go great with a crisp white wine. Although it is spiced with Middle Eastern spices this wouldn’t be a typical Middle Eastern dish due to the use of pork that is widely forbidden for consumption due to religious reasons but I found the flavours work well myself. 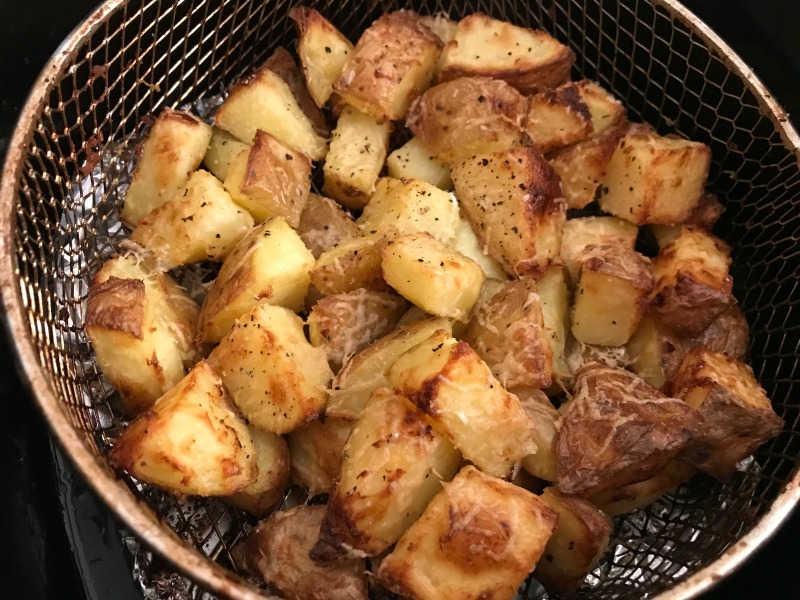 This makes an easy lunch for work or would work really well as a side dish for BBQ for a healthy alternative to potato salad smothered in mayo. Grate the garlic and add the juice of a lemon to a small jar. This will cook the garlic slightly and make it a bit more mellow compared to its raw state. Cook the sausages according to instructions and let cool. Cook the Chickpeas and let cool. 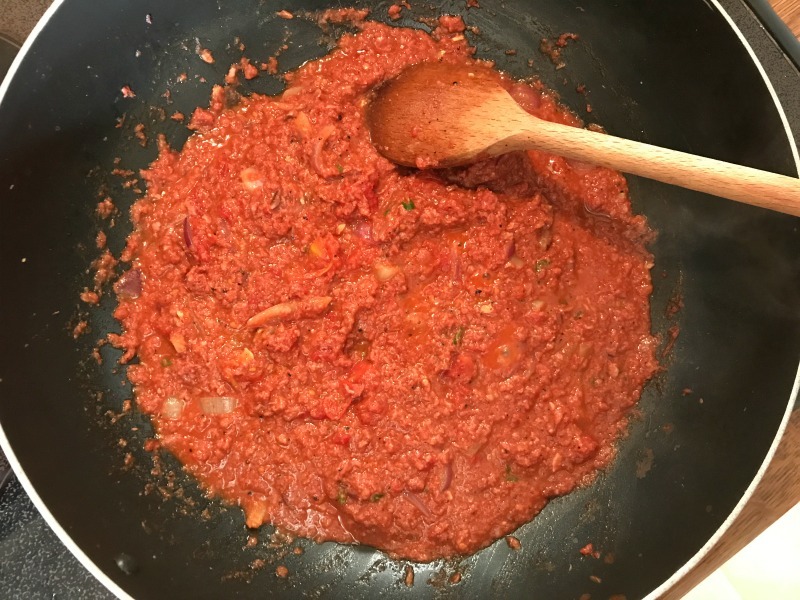 When the cooked ingredients have cooled add them to a large bowl and add the garlic and lemon, red onion, chilli, tomatoes and feta then mix to combine. Add a good glug of extra virgin olive oil and mix again. Add a teaspoon of Za’atar seasoning and season with extra bit of salt and pepper to taste then give it one last mix to combine the seasoning with the rest of the dish. Add more Za’tar if the ingredients are not covered enough and even an extra sprinkle of sumac if you have any. I got both from Tesco from their own brand. Put in the fridge to chil and bring all the flavours together for a few hours or overnight for the following day. Prepart the dressing by adding everything to same bowl. Due to recent food bacteria scares related to beansprouts I added the bag to a steamer for a few minutes to kill the bacteria but still leave crunchy. After a few minutes in the steamer I rinsed under cold water to stop the cooking process and still leave a little crunch. In a seperate large bowl add the vegetables for the slaw one by one after slicing. Pour the dressing over the veggies and mix to combine. Leave to infuse for an hour or two in the fridge. I served this with BBQ’d bulgogi beef lettuce wraps, pickled cucumber, pickled daikon and kimchi for my birthday BBQ last week. It still tasted great for lunch with the leftovers the day after down the beach with a nice cold can on fruity Brewdog Elvis Juice. My turkey mince was quite wet to start with because I had frozen it and defrosted it and added with the wet ingredients meant it had a little bit too much moisture. To help bind the mixture and give a bit of texture I added a couple of spoonfulls of panko breadcrumbs at a time until it made the mixture less wet to work with. Fry the bacon to for a few minutes to cook slightly and for the fat to render out. Remove from the pan and set aside. Fry the garlic, ginger and spring onion for a minute or two in the bacon fat then remove from the pan. Add the bacon, onion, garlic and spring onion mixture to a large bowl with the minced turkey. Add the fish sauce, palm sugar, zest and juice of lime, red pepper flakes, corriander and lemongrass to the bowl. Mix the ingredients into the turkey mince for a few minutes with your hands to fully combine. 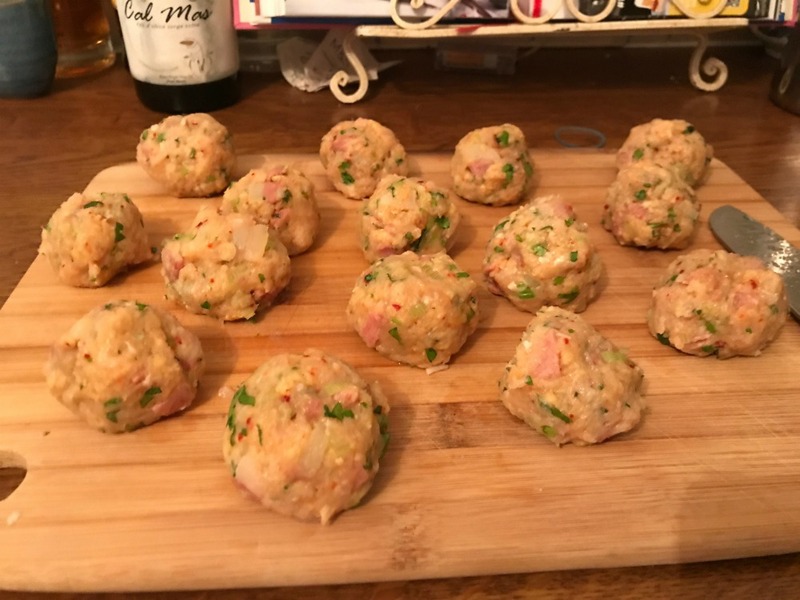 Take small mounds of the minced mixture and shape into little balls and place on a plate or baking tray until you’ve used up all the mixture. Heat a little coconut oil or olive oil into a wok then add all the meatballs. Cook until slightly browned on all sides then add to the oven on 200C for 10 minutes or until cooked through. Place the noodles in salted water and cook to the packets instructions. Take a cup of the cooking liquid before draining the noodles and set aside. Add the fish sauce, soy sauce, sesame oil and sriracha to a small bowl and stir to mix. Add to a warm pan and cook for 30-60 seconds or until it starts to bubble slightly. Add the peanut butter and lime juice to the pan and stir until the peanut butter is smooth. Drop the cooked noodles into the pan and toss with a pair of tongs to coat the noodles in the sauce. Add a bit of the reserved noodle cooking water a bit at a time to loosen the noodles and make the sauce a bit lighter as the peanut butter can be quite thick. Once evenly coated, remove the noodles and divide between two bowls. Add a little more sesame oil if you like and a scattering of sesame seeds. Top with the cooked meatballs and devour at your leisure. Warm the ready cooked noodles in the microwave for a minute just bring them up to temperature. It doesn’t matter if they aren’t boiling as they are going to be added to the pan anyway. Add the chopped kimchi with a little bit of juice in the jar if there is any and the gochujang paste to a wok with a bit of oil to cook for 2-3 minutes on medium heat. Make sure it doesnt burn by stiring every 30 seconds or so. Stir in the grated garlic, add the noodles to the wok, mix to combine then cook for a minute or two. Add the 1/2 stock cube to the boiling water then add to the pan and mix again to make sure the noodles are coated. Cook for another minute or two until done. Divide the noodles between two bowls, scatter the spring onions and sesame seeds equally between the two bowls, drizzle with a bit of toasted sesame oil. Place an uncooked egg yolk in the middle of the bowl and mix everything in with a fork or chopsticks. Now dig in! Grate or chop the garlic and add to a pot or bowl to mix. Squeeze the lemon juice into the garlic and leave it sit for a few minutes. I find this mellows the intensity of raw garlic as the acid cooks it somewhat like a ceviche. Add the garlic powder, onion powder, yogurt, mayo to the pot and mix. Crumble the cheese into the mix and season with salt and pepper to taste. Drizzle a good olive oil on top to finish the dip off and give it one last stir. You can play around with the measurements to your taste but remember the cheese will impart it’s flavour as you let it sit in the fridge so don’t worry if it’s not tasting too intense to start with. Cover and refrigerate for at least an hour. I used mine as a dressing for iceburg lettuce, slaw and rare steak.You could also use as a dip for anything you might fancy such hot wings, breadsticks, carrot sticks, cucumber, tortilla chips.